A workhouse existed in Derby from around 1729 (Hitchcock, 1985). A parliamentary report of 1777 recorded five parish workhouses in operation in Derby — St Alkmund's (with accommodation for up to 34 inmates), All Saints (60), St Michael (14), St Peter (40), and St Werburgh (50). St Alkmund's workhouse, on Lodge Lane, had eight rooms on each of its two floors and its own bakehouse. All Saints was erected in 1729 on Walker Lane. St Werburgh's, built in 1730 on Friar Gate, had 16 rooms, a counting house, a kitchen and a brew house. 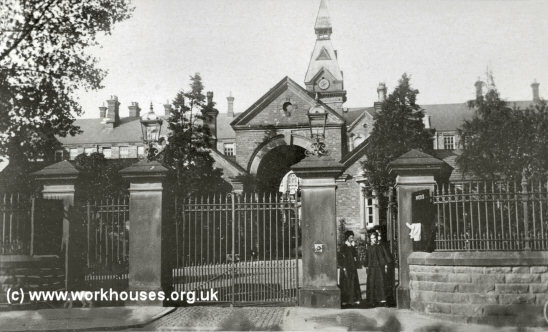 St Peter's workhouse stood in the churchyard with 11 ground-floor rooms and 13 bedrooms. There are 101 ale-houses, i.e. one house in every 16 in the whole town. Each parish except No. 3 has its own Workhouse, that of St Alkmund being the best; it is airy, clean, and well provided with good bedding (feather) and other necessary furniture. The bill of fare in each case is as follows: Breakfast in all cases, and every day, milk pottage. Sunday Butchers' meat, etc. Beef, veal or mutton, with bread, potatoes and broth Beef, broth, bread, potatoes, etc. Butchers' meat, etc. No. 4 About 30lb. (bones included) divided among 40 persons. The number of persons in St Alkmund Workhouse is 36, of whom 6 are under 7 years, 8 between 7 and 12 who do a little work, and the rest are chiefly middle-aged women. Those who can work are mostly employed in the silk and cotton mills, earn about 16s. a week, and get 2d. in the shilling for themselves. One of the out pensioners in this parish is a woman of 50 years of age, who paid £50 to the parish on condition of receiving a weekly allowance of 4s. The number of persons in All Saints' Workhouse is 53, of whom 9 are under 8 years, 15 from 8 to 14 who work in the silk or cotton mills, and each earn from 1s. to 2s. 6d. a week. The others are mostly old and infirm. They work 12 hours a day, exclusive of meal times, and are paid 2½d, in the shilling out of their earnings. There are 39 persons in St Peter's Workhouse, 15 under 12 years. Those who are able work knit or spin for the use of the house, or are employed in the neighbouring silk or cotton mills, receiving 2d. in the shilling out of their earnings. In St Werburgh's workhouse there are 24 persons. Derbyshire: St Alkmund's (6), St Peter's (6), St Werburgh's (6), All Saints' (4), St Michael's (3), Litchurch, Little Chester. The first Derby Union workhouse was built in 1837-8 on the south side of Osmaston Road. It was designed by John Mason. In 1838, the Poor Law Commissioners authorised the sum of £5,360 to be expended on the building which was to accommodate 350 inmates. The building did not follow any of the Poor Law Commissioners standard plans. It adopted a broadly square design but had only two courtyard areas. The location and layout of the workhouse can be seen on the 1852 map below. Derby Osmaston Road workhouse site, 1852. With the erection of the new Uttoxeter Road workhouse, the Osmaston Road site was put up for sale. On December 15th, 1876, it was sold by auction for £9,150 to the Royal Crown Derby company for a new factory. Most of the old workhouse buildings were retained and reused including the present entrance block which now has a brick facade added to its centre. Derby Osmaston Road former workhouse site from the north, 1880s. Derby Osmaston Road former workhouse site from the north-east, 2001. A new Derby Union workhouse was built in 1876-8 at a site on the north side of the Uttoxeter Road. It was designed by local architects William Giles and Robert and Thomas Brookhouse who specialised in public and church buildings. The workhouse location and layout can be seen on the 1913 map below. Derby Uttoxeter Road workhouse site, 1913. A gatehouse stood at the southern entrance to the site, with vagrants' wards to the west. Derby Uttoxeter Road workhouse entrance. Behind the gatehouse stood the three-storey main block with a central clock tower. There was a central dining hall and kitchen block to its rear. Further north lay the chapel with the infirmary to its east. A separate school building lay at the north of the site. Derby former Uttoxeter Road workhouse main block from the south-east. 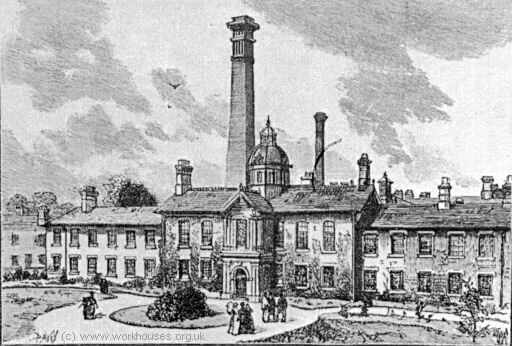 The workhouse later became known as the Boundary House Institution, then after 1948 as Manor Hospital. The hospital closed in 1988 and all the buildings have now been demolished. The site has now been redeveloped for commercial use. From as early as 1914, the Derby Guardians had been considering plans to erect a Poor Law Hospital for the care the union's sick poor. Because of the First World War and its aftermath, the project was shelved until 1925. Towards the end of 1926, work finally began on the scheme on a twenty-eight acre site at the south side of the Uttoxeter Road, almost directly opposite the workhouse. The official laying of foundation stones took place on 29th June, 1927, with stones being laid by Chairman of the Guardians, E.G. Morley, and Clerk to the Guardians, Ralph Grantham. The hospital was officially opened on Saturday 16th November, 1929, by the Mayor of Derby, Alderman JH Grant. The total cost of the hospital, including equipment and furnishings was around £175,000. The buildings, which could accommodate 300 patients, were designed by TH Thorpe. The location and layout of the site are shown on the late 1940s map below. Derby City Hospital site, 1940s. A central administration block was linked by a main corridor to the East and West Ward Blocks. The East Ward Block was two storeys high, with a three-storeyed centre. It contained four thirty-bed wards, each with a day room at the outer end, plus a number of small one-bed and two-bed wards. A nurses' room, bath, stores etc. were placed at the inner end near to the main corridor. The West Ward Block was a little larger but with more small wards. Also connected to the main corridor were the operating theatre, maternity block, and special treatment blocks. A porter's lodge stood at the northern entrance to site, with a mortuary to its rear. A large nurses' home was erected at the south-west of the site in 1932-4. On 1st April, 1930, less than six months after the hospital's official opening, the Local Government Act of 1929 came into operation. On that date, control of the hospital passed to the Derby Town Council. 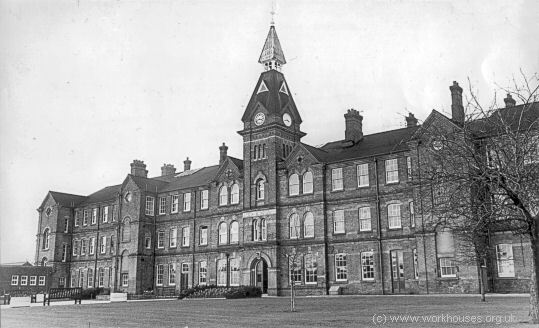 The hospital, now much enlarged, still operates as Derby's City Hospital. From the early 1900s, the union operated a number of children's scattered homes in the city. By 1929, the list included houses at 2-3 Friary Street, 27-29 Clarence Road, 42-44 Park Grove, 89-91 Porter Road, and 35 Gerard Street, which could accommodate a total of 79 children. Each home was supervised by a resident house-mother, with the children attending local schools. 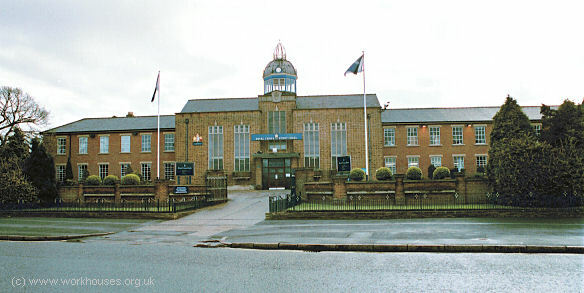 Receiving and Girls' Training Homes were based at 2 Mount Street and Burton Road, Derby, where a further 56 children could be housed. Derby Local Studies Library, 25b Irongate, Derby DE1 3GL. Holdings include: Guardians' minute books (1837-1931); Building Committee minutes (1876-80); etc. Gibson, Hugh (1993) A case of fine china : the story of the founding of Royal Crown Derby 1875-1890 (Royal Crown Derby Porcelain Company).